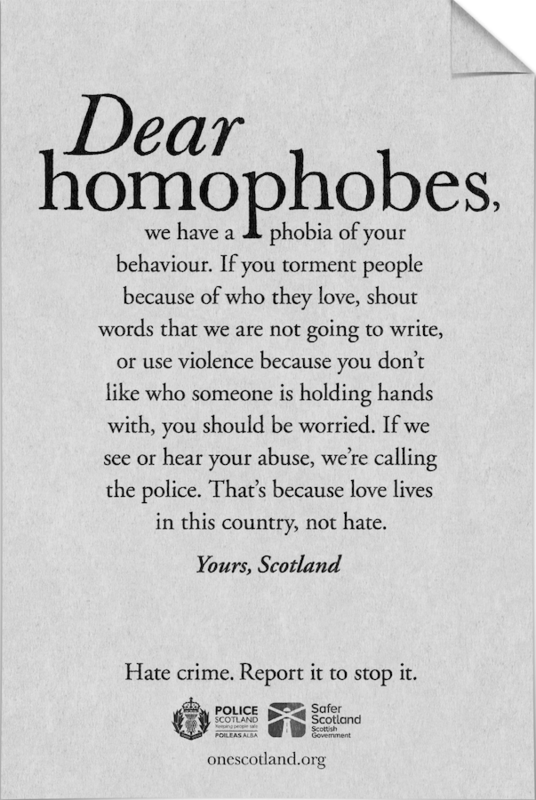 The Scottish government has had enough of hate crimes and is moving forward with a gutsy campaign. According to Pink News, Scotland is launching a new initiative to combat intolerance with messages respectively addressing "bigots," "disablists," "homophobes," "racists," and "transphobes" in a series of ads circulating across the country. Each message is signed on behalf of Scotland. The campaign is part of the Scottish government's One Scotland project in an effort to reduce hate crime. 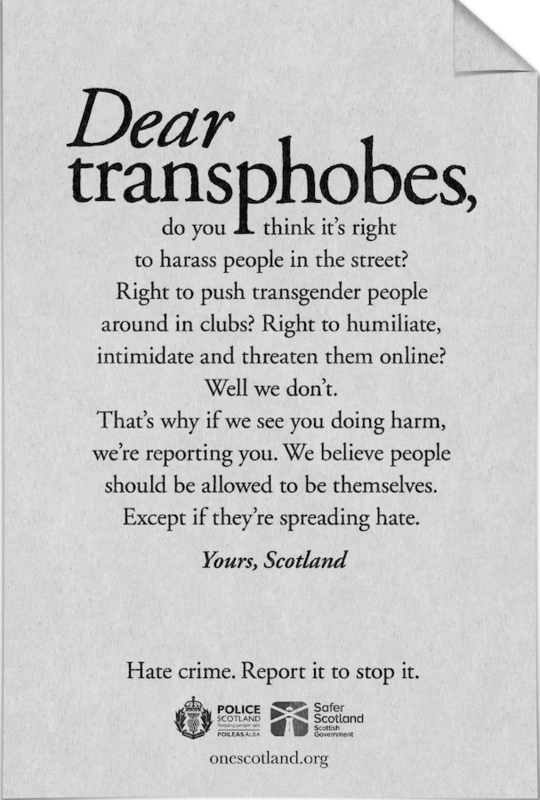 "Dear transphobes, do you think it's right to harass people in the street? Right to push transgender people around in clubs? Right to humiliate, intimidate and threaten them online? Well we don't." "That's why if we see you doing harm, we're reporting you. We believe people should be allowed to be themselves. Except if they're spreading hate." In another letter, the country says it has a "phobia" of homophobic behavior. "If you torment people because of who they love, shout word that we are not going to write, or use violence because you don't like who someone is holding hands with, you should be worried." "If we see or hear your abuse, we're calling the police. That's because love lives in this country, not hate." One Scotland's website describes the organization as one that aims to continue building an inclusive society while recognizing the significant strides made so far towards equality. "One Scotland embodies the inclusive society we want in Scotland, where equality and human rights are respected and every individual and minority group feels valued." The website defines hate crimes as abuse that "can be verbal or physical and has hugely damaging effects on the victims, their families and communities, and we all must play our part to challenge it." "Police Scotland takes hate crime very seriously. In the last year there were over 5,300 charges of hate crime reported to the Procurator Fiscal in Scotland1." "However, there are many more incidents that go unreported. We all have a responsibility to report hate crime if we witness it – it's the only way we can challenge it, and put an end to it for good." Justice minister Humza Yousaf is familiar with being a victim of a bigotry and is encouraging people to call out and report any incidents involving harassment. "As somebody who has faced Islamaphobic and racial abuse over the years, I know how upsetting being a victim of hate can be. Hate crime and prejudice are completely unacceptable and we are absolutely committed to tackling it." "We all have a role to play in stamping out prejudice and I would ask anyone who witnesses a hate crime to play their part and report it. Justice agencies such the police and Crown Office will deal sensitively with reports made and people should have confidence in how they will be treated. Last year there were over 5,300 charges of hate crime reported to the Procurator Fiscal in Scotland but there are still many incidents that are going unreported." Henrietta Mochrie identifies as transgender and has been the victim of repeated harassment and abuse. She emphasized the importance of speaking out against the hatred. "I'll often get street harassment, sometimes this has escalated to the point where I've been followed by people shouting abuse at me, just because of who I am." "It makes me feel really down and scared to leave the house. It's important that if you witness hate crime that you report it to take a stand against hate." One Scotland's ad campaign officially launched on Wednesday. Hopefully, it won't take too long before other nations follow suit in this bold, yet necessary fight for equality.